In the St. Petersburg there are 249 street clocks. They are located in places with the biggest flock - on the squares in front of stations and on the streets in front of the central metro stations. The first city clock appeared in St. Petersburg in 1704 in the Peter-Paul Fortress. In their design there was a bell noting each hour with a chime. And later on a stone Peter-Paul Cathedral appeared a chime of the Dutch masters' work. They changed and were under repairs many times, but also in our times they signal each fifteen minutes and half an hour by a bell chime; and hourly sounds "The Glory of Our God» and midday after a gunshot – "God save the king». This is a unique mechanical power device of the master James Koks who created it together with Friedrich Ury. 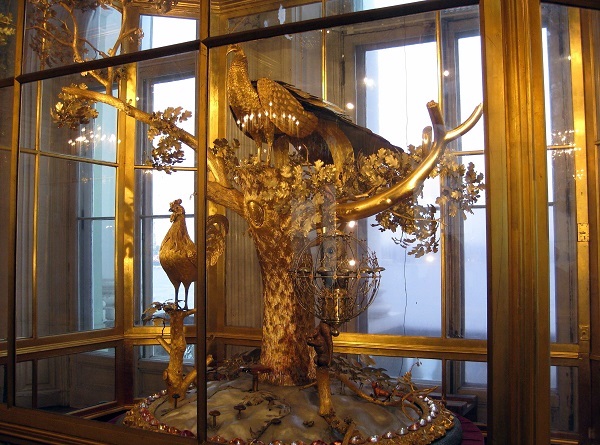 The clock was bought by Potemkin for Catherine the Great. They were brought to St. Petersburg only in 1792 when the empress's favourite already died. At first they were exhibited at the Taurida Palace, and then they were transported in Winter Palace where they are still stored. They were twice repaired by a famous Kulibin (at transportation a part of details was damaged). But in general unique clock survived without changes up to now - this is the only known large mechanical gauge of the 18th century which still did not fall out up to nowadays. The clock barometer on Malaya Konyushennaya Street. Electronic clock with a barometer (atmospheric-pressure gage) was installed on Malaya Konyushennaya Street in 1998. It showed even a day, year and air temperature for a long period of time. 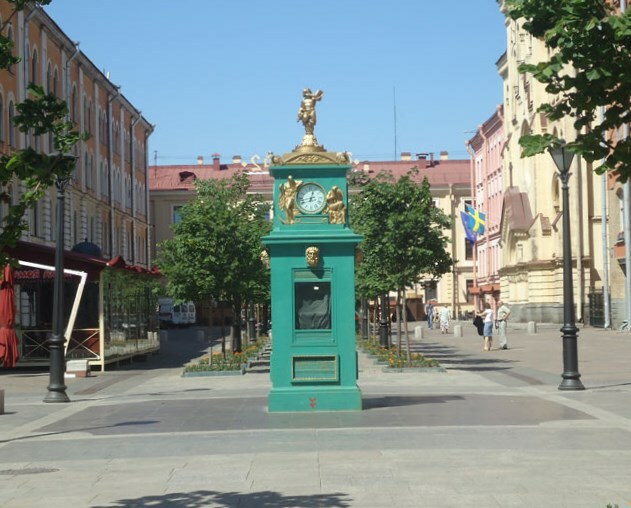 Together with monuments to Gogol and policeman, clock is a sight of the first pedestrian street in modern St. Petersburg. 3. The water-clock ("Vodyanye chasy") on Malaya Sadovaya Street. One of the most known sights is the fountain "Shar" ("Sphere") on the pedestrian zone of Malaya Sadovaya Street. Most of inhabitants and city visitors consider that the fountain "Shar" - is a decoration. But, if you look narrowly, it will turn out that it is possible to know the time of a day using this fountain. "Shar" rotates from the water movement, and as it was conceived that each hour the direction of streams which fall from step to step and then - on figures, uses to change. This is a master copy of that gushing construction which was located Peterhof under the rule of Catherine the Great. But the sphere was made from copper and it weighed only 200 kg. The author of a unique construction, is not who other, as Mikhaylo Lomonosov. Under the rule of Alexander I the fountain was removed, for the reason that it reminded tsar the Masonic sign. Solar milestones begin from the intersection of Moskovsky Avenue and Fontanka Embankment. In St. Petersburg there are several remained marble milestones that were established at the time of Catherine the Great on the road conducting to Tsarskoye Selo, beginning from city border that passed those times across Fontanka. All of them were equipped with the sundial, the simplest chronometer in the world: the shadow from a special stick falls on the dial and moves together with the sun. In 2014 after reconstruction the descent of hours took place on the Dumskaya Clock Tower. Stroke of this chiming clock signalizes not only each hour, but also "a quarter" - that is 15 minutes. At this the mechanism operating now has the ancient construction in its basis created by the St. Petersburg hour firm "Friedrich Winter" at the end of the 19th century for the clock of Dumskaya Tower. This mechanism remained well, having got through nearly two centuries. Clock is activated by a chain construction with weights; it is placed in the mine of 20 meters in depth. One "winding" of clock is enough for the whole week. The Flower clock ("Cvetochnye chasy") in Alexandrovsky Garden. The most unusual clocks in St. Petersburg is the Flower clocks ("Cvetochnye chasy") opposite to the theater Baltic House («Baltijskij dom») and Planetarium. This is a gift of the city Geneva on the 300 anniversary of the Northern Capital.